Bernanke told lawmakers that he can't say that the Libor rate setting process is reliable. WASHINGTON (CNNMoney) -- Federal Reserve Chairman Ben Bernanke cast doubt Tuesday that a critical financial rate used by banks to set interest rates for loans is reliable. Bernanke called the Libor system "structurally flawed" in a hearing before the Senate Banking Committee. When asked if the Libor rate is reliable, Bernanke said he couldn't "give that assurance with full confidence," because the British financial trade group that oversees the rate-setting process rebuffed recommendations to reform Libor suggested by U.S. regulators. The Libor rate -- currently used to calculate trillions of dollars in consumer and business loans around the world -- has been in the spotlight since revelations that Barclays (BCS) manipulated Libor to benefit trades and its own bottom line. The bank agreed last month to settle manipulation charges and pay U.S. and British regulators some $450 million, which has weakened trust that banks are setting rates on loans fairly and honestly. Bernanke spent much of his testimony before the Senate panel defending the role of the New York Federal Reserve, which had also received reports back in 2008 that Barclays was manipulating Libor. 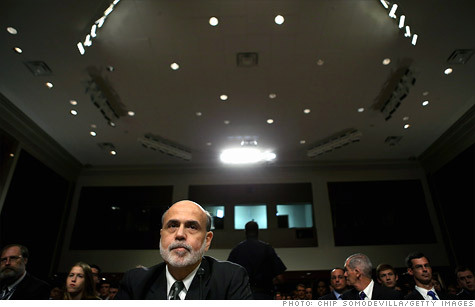 "It's important to note that following (the) disclosures there was rapid follow up," Bernanke said. He said that the Fed set up a working group to look into the Libor rate-setting allegations and notified British regulators and Treasury of their progress. He said that the New York Federal Reserve sent a lengthy list of suggestions to reform the benchmark rate to the Bank of England and the British Bankers' Association, which oversees the Libor-setting process. But Bernanke said that while the Fed is "uncomfortable" with the Libor rate-setting process, there's not much U.S. regulators can do other than make suggestions. Bernanke also made it clear the Fed didn't know that Barclays had manipulated the Libor rate to help the bank. The Fed had only heard that Libor rate was being rigged to ward off concerns that the bank's balance sheets were weak. Bernanke also explained that the height of the financial crisis was a particularly tough time to get a good sense of the accurate rate of interbank lending, since banks weren't lending to one another. When Sen. David Vitter, a Louisiana Republican, asked if U.S. banks were guilty of manipulating Libor in the same way that Barclays did, Bernanke said the investigation was ongoing. In the past few weeks both JPMorgan Chase (JPM, Fortune 500) and Citigroup (C, Fortune 500) have said they're under investigation. But Bernanke agreed that "we don't know" yet if U.S. banks manipulated Libor to benefit their trades.